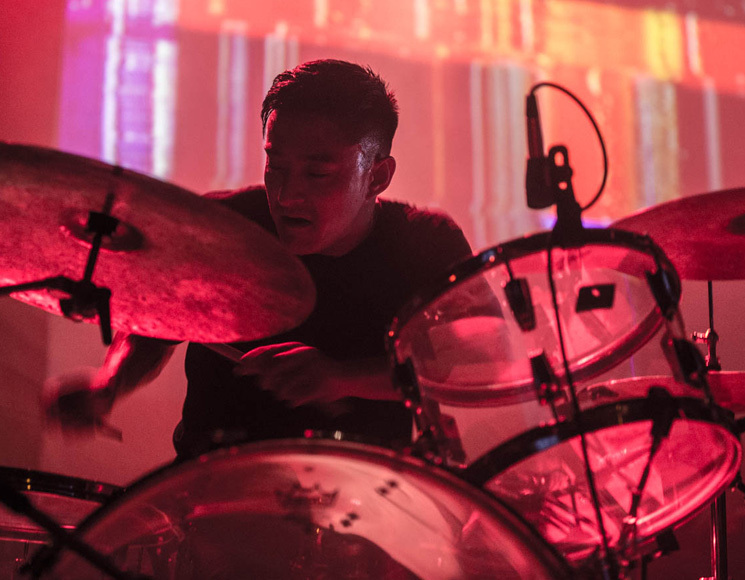 As Michigan-based producer Zach Saginaw hit the stage, the man they also call Shigeto requested that people move closer, which he said would make everything better for him and for the audience. For those clinging to the comfortable seats at the back of the Rickshaw, he promised to give a reason to get up. As three screens of scrambled channels with VHS saturation and bellowing fog filled the space, Saginaw quickly worked up a sweat tweaking his cerebral, atmospheric beats on a MIDI controller linked up to a MacBook with a Ghostly International sticker that transformed its logo into a pair of glowing ghost eyes. His set-up appeared relatively simple, but he was active on the mixer, ever bobbing and stepping like he might break out in a hip-hop dance routine at any second. Instead of dancing, he would sit down at the full drum kit next to his station, and lay down some choice rhythms to flesh out his sophisticated electronics. This cat could really drum. Tastefully transitioning his jazz, IDM, and ambient-laced compositions to keep the momentum going, he delivered on his initial promise as he worked the room into a sweat box.